Animix, the Israel International Animation, Comics & Caricature Festival will take place from August 8 – 12, 2017 at the Tel Aviv Cinematheque. Now in its 17th edition, Animix is an amazing marathon of animated films, exhibitions, lectures, workshops, activities for kids, and master classes. The full program is available (in Hebrew) on the Animix website. Israeli animation is the focus of ASIFA (the Israeli chapter of Association Internationale du Film d’Animation), with several screening events, featuring the best of Israeli animation from the past year and awards to the top films. Asif means harvest in Hebrew, and the harvest of Israeli animated films reveals diverse themes, approaches and techniques in both personal and commercial projects. Best of Israeli animation 2017 will be shown on Wednesday, August 9th at 17:30 in Cinema 4, and at 19:00 in Cinema 2. Ticket information is available on this link. A screening of the top nominated films and winners will take place on Thursday, August 10th at 20:00 in Cinema 1. Ticket information is available on this link. Israeli illustrator and caricature artist Amos Ellenbogen will be honored at the festival. His work has appeared in numerous publications, including Yediot Ahronot, LaIsha, Monitin, and Ha’Ir. Ellenbogen specializes in gag cartoon and in recent years has been collaborating with Nir Mulad on Blisters. 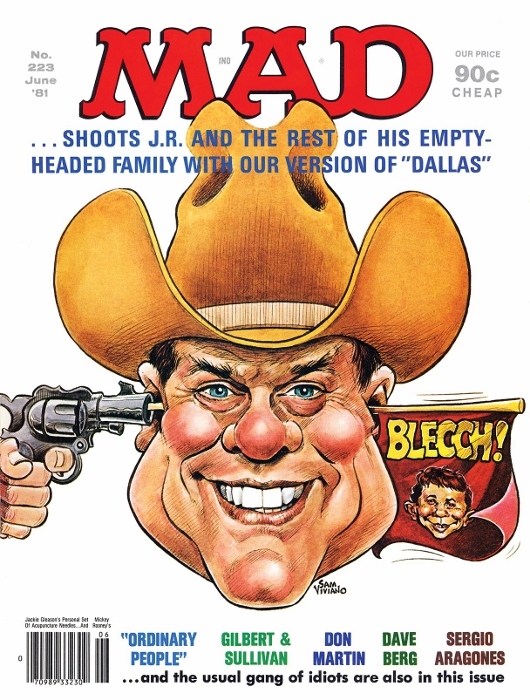 Sam Viviano, Art Director of MAD Magazine since 1999, will give two talks at the festival. In honor of his visit, there will be an exhibit of illustrations by Israeli artists in tribute to MAD’s 65th anniversary. Viviano’s visual style with the signature wide-jaw look is well known. 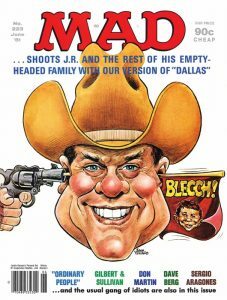 His first cover for MAD was for issue #223 (June 1981), during the heyday of the television series Dallas – a caricature of actor Larry Hagman in his role of J. R. Ewing being shot through the ear with an Alfred E. Neuman flag. On Wednesday, August 9th Viviano will talk about his 50-year career in illustration, and two decades as MAD’s Art Director. The talk will take place at 19:00, in Cinema 4. Ticket information on this link. 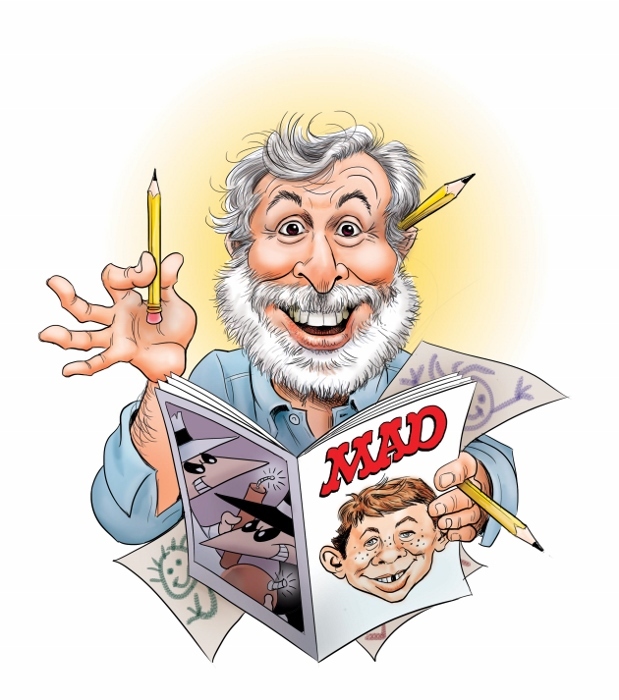 Viviano will also give a talk on 65 Years of MAD Magazine, on Thursday, August 10th at 18:30 in Cinema 2, and once more on Saturday, August 12th at 13:00 in Cinema 4. Ticket information on this link. John Layman, best known for creating Chew, a series that focuses on Tony Chew, a detective who is a Cibopath and received psychic impressions from food that enable him to solve crimes. Chew was published by Image Comics from 2009 – 2016. Layman has also created comics for both DC and Marvel, working on Spiderman, X-Men, Batman, and many other well-known figures. On Saturday, August 12th Layman will give a talk on the artistic process: creating comics, characters and story. The talk will take place at 20:30 in Cinema 5. Link to ticket information here. On Wednesday, August 9th Layman will give a talk on the differences between working independently (creator-owned) and working with large organizations like Marvel and DC. A look behind the scenes in the comics industry. The talk will take place at 15:00 in Cinema 2. Link to ticket information here. Cesar Coelho is one of the founders and co-directors of the Anima Mundi festival in Brazil. Coelho is owner of the production company Campo 4 Desenhos Animados. He worked as animation director for the two seasons of the miniseries “Hoje é Dia de Maria” and “Afinal o que querem as mulheres”, and for the soap opera “Meu Pedacinho de Chão”, and was animation coordinator for the Closing Ceremony of the Rio 2016 Olympic Games. Coelho will give a talk on Anima Mundi and a screening of latest in Brazilian animation on Wednesday, August 10th at 22:00 in Cinema 2, and once more on Saturday, August 12th at 22:00 in Cinema 2. Link to ticket information here. Coelho will also present Brazilian animation from past years on Tuesday, August 8th at 18:30 in Cinema 2. Link to ticket information here. Window Horses by Ann Marie Fleming tells the story of Rosie Ming (voiced by Sandra Oh), a Chinese/Persian girl who writes poetry. Her Iranian father abandoned the family when Rosie was 7, and she grew up with her protective Chinese grandparents in Vancouver. Invited to participate in a poetry festival in Shiraz, Iran Rosie begins a process of self-discovery. Screening dates and times on this link. Ethel & Ernest by Roger Mainwood, is an adaptation of Raymond Brigg’s graphic novel, a personal memoir of his parents and their love for one another. Briggs and Mainwood collaborated very closely on the script and storyboard. Ernest is voiced by Jim Boardbent, and Brenda Blethyn is Ethel. The story of their love takes place against the backdrop of a changing world, as they live through the Depression and World War II. Harry Collet plays Raymond as a child, and Luke Treadaway is the adult Raymond. Screening dates and times on this link. Zoom is a live action/animation comedy directed by Pedro Morelli. The very meta film features a complex plot involving a comic book artist Emma Boyles (Alison Pill), a novelist Michelle (Mariana Ximenes), and a film director Edward Deacon (Gael Garcia Bernal). Each exists in a separate reality (marked by different visual styles), and each is creating a story about one of the others. Screening dates and times on this link. Louise by the Shore, directed by Jean-François Laguionie, tells the story of an elderly woman at a French seaside town. Dominique Frot stars as Louise, who misses the last train out from the Breton resort where she spends her summers. Stranded in the empty town, she befriends a stray dog Pepper (voiced by Laguionie), and passes the winter with her new friend and her memories of the past. Screening dates and times on this link. The full program and ticket information may be found on the Animix website. Animix Artistic director: Nissim Hezkiyahu, Animation curator: Dudu Shalita, Producer: Galit Bersky.